bedToBam converts features in a feature file to BAM format. This is useful as an efficient means of storing large genome annotations in a compact, indexed format for visualization purposes. -bed12 Indicate that the input BED file is in BED12 (a.k.a “blocked” BED) format. 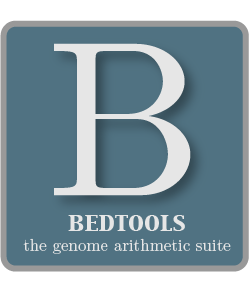 In this case, bedToBam will convert blocked BED features (e.g., gene annotaions) into “spliced” BAM alignments by creating an appropriate CIGAR string. Optionally, bedToBam will create spliced BAM entries from “blocked” BED features by using the -bed12 option. This will create CIGAR strings in the BAM output that will be displayed as “spliced” alignments. The image illustrates this behavior, as the top track is a BAM representation (using bedToBam) of a BED file of UCSC genes.